If you ask teachers to say the two main reasons why they chose their profession, many will say, "July and August." But not me. I embrace the job and have a zillion more important reasons, including "making a difference." I do enjoy the summers off yet still feel the need to be productive. With the summer approaching, I am thinking of solid ways of being productive when I am off. 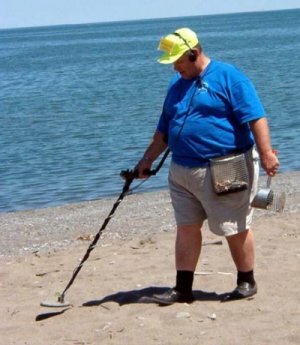 I can think of nothing more productive than purchasing a metal detector and striking it rich from the buried treasures found on beaches. By my calculations, if I buy a Kellyco Hybrid Cobra beach metal detector for $449.95, then I will easily make back my initial investment in 2 years, 9 months. 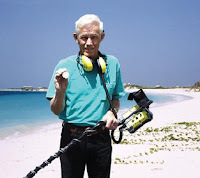 If I had a glorious Kellyco beach metal detector, I would find approximately $0.45 per day, as long as I put eight hours into metal detecting each time. Assuming I did that every day (including the school year) for 2 years, 9 months, I would recoup my $449.95. Then, in the next July and August, I would metal detect every day and earn $27.45. That's what I call easy money! Whenever I run across something too good to be true, I must take a step back and wonder if what I have discovered is truly that special. 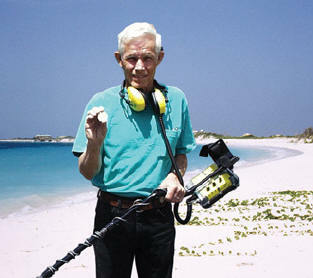 After doing the math, thinking through things slowly and clearly, I must say that metal detecting on beaches is the way to go. If you ever happen to see a metal detecting beach guy, it is obvious. Look at the chap's countenance. Yeah, it's true. He's got the world figured out. Give me just three years. Expect my skin to turn leathery from being on beaches for eight hours per day. But bank account, get ready. Here comes $27.45! I say if you have determination then you will succeed. I agree, determination is the key to success.